Below you will find the video from our re-enactment of the Battle of Queenston Heights. Thanks for participating, even though it was so cold! Given what we read from Pierre Berton in “The Invasion of Canada” and from Robert Vineberg in “The Forgotten Man Who Saved Canada at Queenston Heights”, why do we celebrate Brock, even though it was Sheaffe and Norton (Mohawks) who truly saved Canada? 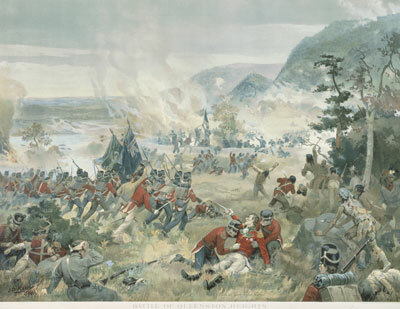 Why was the myth of Brock, including his famous last words, “Push on brave York Volunteers”, created and ultimately perpetuated throughout Upper and Lower Canada? Why was myth important then and why is it imporant now?